As we went with more of a square-ish look (grid based movement), it was natural to slice Box Kid into squares and do something with it. The idea was simple, after cutting our hero, all squares moves into the teleport. But, ehmm, it didn’t started well. My hopes were gone. ‘It looks awful, I won’t be able to do anything with that! … Ok, it’s only the beginning, let’s give it a soul!’ After reassuring myself, and with a strict plan, I hoped right into action. So I created new spreadsheet, made some values, divided some numbers and voilà – now I knew with what speed which square needs to move. Oh, I was so excited. I typed in some math, making variables that could easily allow me to change things up (speed, time, width, etc.). I checked if I didn’t missed anything. 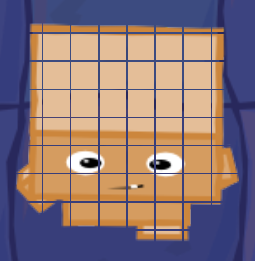 Code had to run flawlessly no matter from which side you’re going into the teleport, and Box Kid has different width and height (128×192), so there is more rows of squares when you want to aproach the teleport from up or down. Bunch of arrays was set and all that was left, was updating the draw event with those new variables. Ok, I fixed some numbers, lunched the game again, and ‘Oh yeah!’ it looks good. It looks even better then I expected. I made it so Box Kid dismembers, squares go away, and then with more speed flies right into the teleport. I’m not changing the size of the squares, yet they seem to enlarge and shrink. That’s the space between them what creates the illusion. Pretty good and valuable to remember. But from now on, there are preparations for our visit at Pixel Heaven 2015 in Warsaw, this Saturday, where we’ll be showing the newest playable build of Box Kid Adventures! Also don’t forget that we’re still fighting with the STEAM Greenlight, so go here and vote “yes” if you want to see Box Kid Adventures on STEAM.